While we don’t usually think of mold as having any beneficial qualities, it serves a purpose by helping decompose dead matter in the natural world. You don’t want mold inside your home, however, which is likely not something we need to remind you about! 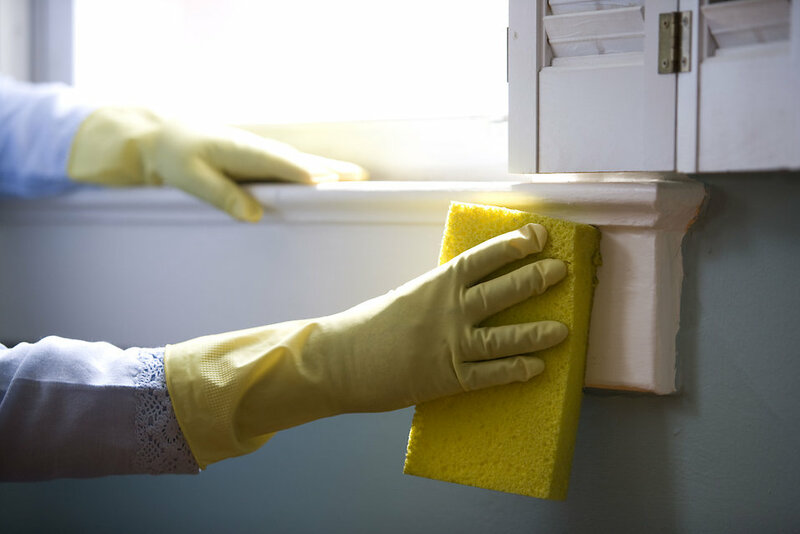 Luckily, there are techniques for removing mold in your home that use common and natural household products that you probably already have. Are you smelling something musty or noticing dark patches of mold in moisture-ridden areas inside of your house? It’s time to take matters into your own hands—or, you can always hire someone else to tackle mold remediation. If the problem has become severe, or if the signs point to mold issues underneath your floors or inside of your walls, hiring a professional is your best option. If you do decide to DIY it, know that completely eradicating mold is an unrealistic expectation. However, reducing the problem by removing mold in your home keeps more mold from growing so that your family has a healthier place to live. 1. You’ll want to be properly dressed, so put on goggles, gloves made from rubber or latex, a particle mask, and clothing that will protect your entire body. 2. Keep the mold contained by using duct tape and plastic to cover vents and other areas prone to airflow. It may also be helpful to open a window. Just be sure to place an outward-facing fan on the sill to make sure any errant spores end up where they belong: outdoors! 3. Take a stiff-bristled brush and clean the infected area with soap and water. 4. Take a disinfectant, like grapefruit seed extract (20 drops to 2 cups of water), tea tree oil (1 tsp. to 1 cup of water) or distilled white vinegar (this can be applied without diluting it) and apply it to the mold. Also be sure to spray the area around the visible mold to make sure you’ve taken care of anything too small to see. Solutions made using other household products, such as hydrogen peroxide, Borax, and bleach can also be used to kill mold, but avoid these if you’re removing mold in your home by taking the less toxic, more gentle route. 5. If you’re using household vinegar, rinse with very hot water and let it dry completely. Once everything is dry, vacuum the area. For more advice on handling and preventing mold in your home, see “What to Do If Your House Has Mold (Or You Think It Does). Does my Home Have Mold? If you are not sure if your home has mold, but are experiencing symptoms such as increased allergies at home, bring in a professional home inspector who offers mold inspections. At Hub City Home Inspections, we will thoroughly inspect your home with a moisture meter so that you’ll know if there’s a mold issue and if so, how severe. If you need a mold inspection in southern Mississippi, contact Hub City Home Inspections today!